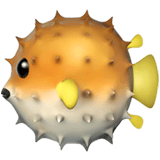 🐡 Blowfish Emoji is the picture of tropical fish that puffed up into a spikey ball. This transformation is a protective reaction to an aggressive environment. Thus, you can show that you are so overwhelmed with some kind of feelings or emotions that you are about to 💥 explode. Also it can mean that you have an incredible story about which you can no longer be silent and is about to speak. Or maybe you are just offended by someone, 😡 pouted, put out your thorns and do not want to communicate. In a direct sense, this emoji may denote a fish treat, popular in Japan, despite its high toxicity when improperly processed. This fish is also known as fugu or the puffer fish. 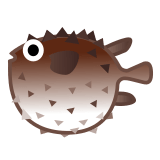 Blowfish Emoji was approved as part of Unicode 6.0 standard in 2010 with a U+1F421 codepoint, and currently is listed in 🐶 Animals & Nature category. Use symbol 🐡 to copy and paste Blowfish Emoji or &#128033; code for HTML. This emoji is mature enough and should work on all devices. You can get similar and related emoji at the bottom of this page.